My talk is going to be about new developments in MySQL Server 5.5, 5.6, Percona Server, MariaDB and Drizzle as it relates to high volume/large scale projects. There is a lot of really cool things happening in MySQL space recently and I would love to share those with you. given in Russian. Bring your laptop if you have one for more Hands On experience. If you would like to do business with Percona I will be available for business development and consulting meetings on Thursday and Friday next week. Finally note We’re Hiring worldwide for most of positions, so if you’re interested joining Percona Team, come and talk to me. We have both technical and non technical positions, in particular we’re looking for Sales and Business Development person in Russia. Why so late announcement. Ah if you must know I did not know if I will be able to make it until very last minute. My passport was stalled in the British Consulate getting visa to UK for Percona Live London in late October. It is great we could get the documents back in time for my travel. 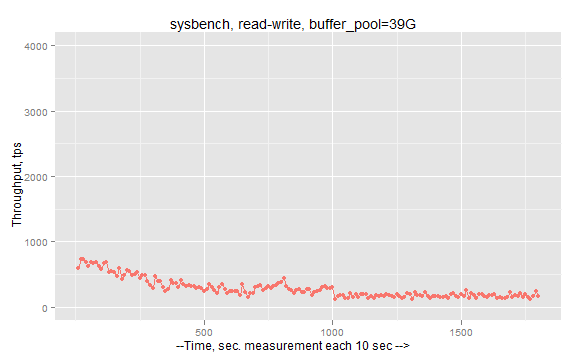 So let’s run experiment as in previous post, this is sysbench fileio random write on different file size, from 10GiB to 140GiB with 10GiB step. I use ext4 filesystem, and I perform filesystem format before increasing filesize. As you see, second time the throughput is much worse, even on medium size files. Just after 50GiB size, throughput gets below 40MiB/sec And this is with the fact, that I perform filesystem format before each run. This leads me to conclusion that write performance on Intel 320 SSD is decreasing in time, and actually it is quite unpredictable in each given point of time. Filesystem format does not help, and only secure erase procedure allows to return to initial state. There are commands for this procedure for reference. Discussing this problem with engineers working with Intel 320 SSD drives I was advised to use artificial space provisioning, about 20%. Basically we create partition which takes only 80% of space. So let’s try this. The experiment the same as previously, with difference that I use 120G partition, and max filesize is 110GiB. You can see that throughput in first iteration is basically the same as with full drive, but second iteration performs much better. Throughput never drops below 40MiB/sec, and stays on about 50MiB/sec level. So, I think, this advise to use space provisioning is worth to consider if you want to have some kind of protection and maintain throughput on some level. The previous installment demonstrated how to use an index to cluster table rows together. The examples showed that even “anywhere” LIKE expressions can be tuned when the column is put into the index to avoid the table access. Todays installment extends this concept and shows queries that don’t need to access the table at all. It’s about the so-called index-only scan, or, less descriptive, covering index. If NDB cluster is a technology that interests you and you would like to learn more, this tutorial is for you. Make sure to check out our website http://www.percona.com/live/london-2011/schedule-tutorial/ to get our full list of tutorials and conference schedules. For a chance to win a free ticket to Percona Live London simply watch our @Percona Twitter stream and retweet the contest to win a free ticket! One lucky winner will be picked every Friday up until the conference. Have a great weekend and make sure to tweet to enter our TGIF contest for a chance to win! If you don’t win this time, try next Friday or register now and get the Early Bird price! (but don’t wait too long: it expires September 28th). See in London! The basic infrastructure is up and running. That means there is the basic layout, the menues, authentication and user management working. From now on I will work on the feature set. I will keep you informed whats up and coming. I uploaded a new webpage (rough) on the new Main project website (http://www.cuteflow-project.org). The VServer the page is running is sponsored by the Filloo GmbH. Thanks for it guys. There is only little content at the moment but it will grow as the version will be more complete. BTW the website is built with the Silex Framework. The Documentation infrastructure is up and running too. The documentation source (written in ReST, converted by Sphinx) is hosted on GitHub. We use ReadTheDocs to automatically build the HTML-Documentation from the Git-Repository. You can find the current version of the docu here. I would be still more than happy about helping hands. There is some interest and first code writte by others but more is appreciated. You can find some first information in the documentation. Not interested in Replication? Come see others speak on topics from Handler Socket to Programmatic Queries. With 45 sessions not including the keynotes you are bound to find something that will spark an interest. To share our excitement we are extending our Early Bird Pricing until September 28th! Register now for this conference and save 25% off the Regular Registration price. This offer won’t last long so register today! The conclusion is that Flashcache can be good for read-heavy workloads, but more research is needed to understand its performance characteristics on write-heavy workloads. We explain the details of exactly how good and under what circumstances. We also developed some guidelines for sizing and pricing, to serve as advice for those interested in deploying Flashcache as a way of getting some of the benefit of flash without all of the cost, or the size limitations. 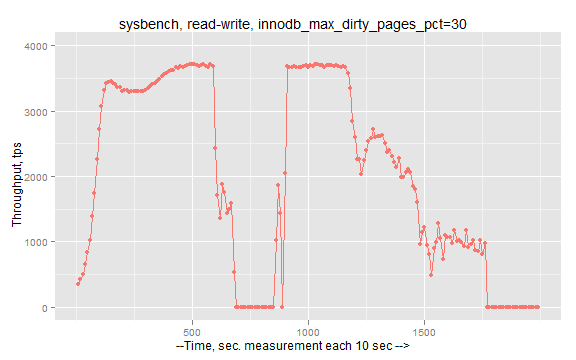 This was not often recurring problem so far, however in my recent experiments, I observe it in very simple sysbench workload on hardware which can be considered as typical nowadays. Hardware: HP ProLiant DL380 G6, with 72GB of RAM and RAID10 on 8 disks. 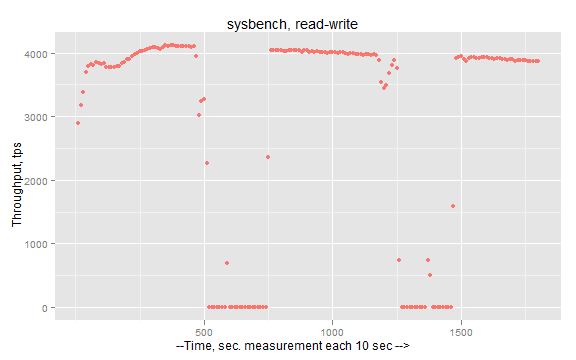 I took sysbench multi-tables workload, with 20 tables, 10,000,000 rows each. Total database size ~58GB. Basically there two stages: MySQL handles traffic and MySQL stuck. As you see stalls are very severe. There are 4 mins periods, when MySQL is not able to process query. to catch up with flushing changed data. With widely adoption of MySQL 5.5 and servers with big memory configuration I expect we will see this problem more and more often on production systems. This is question I am asked, how do we know that stall we see is related to InnoDB flushing and “sync” state. Vanilla MySQL does not provide much diagnostic there, but there couple numbers to look into. and if this number grow, that means InnoDB flushes more than your IO system can afford. Second, you need to a little math. (“Log flushed up to” – “Last checkpoint at”) this is our checkpoint age. In our case it is 3025148100 or 2885M . Our summary log size is 3800M. InnoDB usually takes 75% mark as limit for “sync” stage ( 3800M * 0.75 = 2850M ). That is checkpoint age exceeds 75% sync mark, that is signal that InnoDB performs in “sync” flushing mode. So math formula for this: if (“Log flushed up to” – “Last checkpoint at”) > “total log size” * 0.75 , then InnoDB is in “sync” mode. I whish I could say you should use Percona Server with XtraDB. 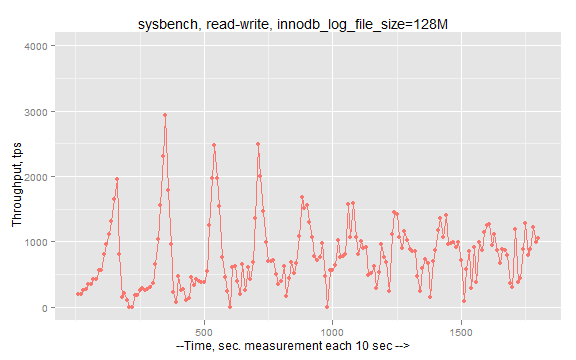 HDD, while for SSD in Percona Server we have “innodb_adaptive_flushing_method = keep_average”. Unfortunately on spinning disks (as in this case), Percona Server may not show significant improvement. I am going to followup with results on Percona Server. and hopefully it will spend less time in “sync” flushing. Although maximal throughput decreased and stall period is somewhat shorter, I cannot see this is helpful. Second action what you may try, is to decrease innodb_log_file_size. How this may help ? InnoDB flushing may kick-in faster, and do not allow to have a lot of modified pages in buffer pool. Well, stability and absolute value of throughput are far from perfect, but, at least, we do not have 4 min stalls. Will it help if we decrease innodb_buffer_pool (effectively killing idea that more memory is better), the same way InnoDB will not be able to change a lot of data . The following results are with innodb_buffer_pool_size=39G. There I keep Y scale as first graph to show impact on performance by this action. Finally we got somewhat stable result without stalls, but by loosing about 20x throughput. These facts give me idea that existing InnoDB flushing algorithm is not suitable for modern hardware with a lot of memory. I hope there is work in progress for MySQL 5.6. Scripts and raw results you can find there.